Hello Wizards! This is the post for this week's giveaway. The rules are the same as last week's giveaway. Comment below if you would like to be entered. And remember, you need to be following this blog as well. The winner will be randomly chosen on Friday at 12:00pm EST, and will be announced shortly after. **Edit** I have added a link in the left sidebar to this post to make it easier to find later in the week. This link will be updated weekly with the new link. Thanks! This is a really good idea! You already have 25 followers! Nice! 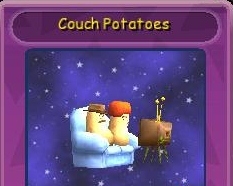 Couch potatoes! :) I wonder what they watch all day? P.S. Your blog looks awesome!